Romfil Crossflow Filtration Systems XF have always convinced our customers with their performance, efficiency and gentle treatment of the filtrate. Operation with the new technology of EVOFLOW CROSSFLOW FILTRATION SYSTEMS XF is even more energy-saving, quieter and much more environmentally friendly. As a consequence, production costs will be reduced. 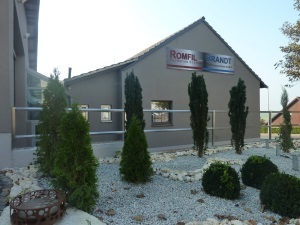 The gentle treatment of the filtrate, which is typical for Romfil products and also particularly important for the filtration of wine, could be further improved. As one of the few manufacturers of Crossflow Filtration Systems Romfil offers Crossflow Filtration Systems that comply with EU regulation 10/2011 on plastic materials and articles intended to come into contact with food. Depending on their individual demands and requirements, customers may choose from different models of Romfil Evoflow Filtration Systems. Starting with the entry-level model with one or two modules, all ROMFIL Crossflow Filtration Systems are equipped with standard reduced volume automatic cut-off. The XF Basic Systems offer a well-priced entry-level version into Crossflow Filtration. Basic Systems are equipped with standard Evoflux modules and possess all required features for Crossflow filtration. All other XF Systems offer a large number of technical features, e.g. Romfil Evoflush – automatic backflush. Depending on customers‘ requirements, XF Systems are equipped with a wide range of features – up to fully automatic filtration. After reduced volume automatic cut-off, fully automatic Romfil Crossflow Filtration Systems XFA (starting with four modules) automatically start water flushing or – optionally – chemical cleaning. Then they independently return to filtration mode. As XFA-Systems can be operated unobservedly over longer periods, they are very attractive for large wineries.